The My China Emperor Rim line from Sieger is so beautiful. Love the bird motif that’s carried from serving and dinner plates to pasta plates and saucers to footed bowls and teapots. Teriffic line… I’d love to see this mix and matched with white or gold plates. eTabletop.com is a site I just got introduced to from this month’s Lucky Mag. Some great tabletop pieces to be had on there plus they have a registry for all you marrieds-to-be! 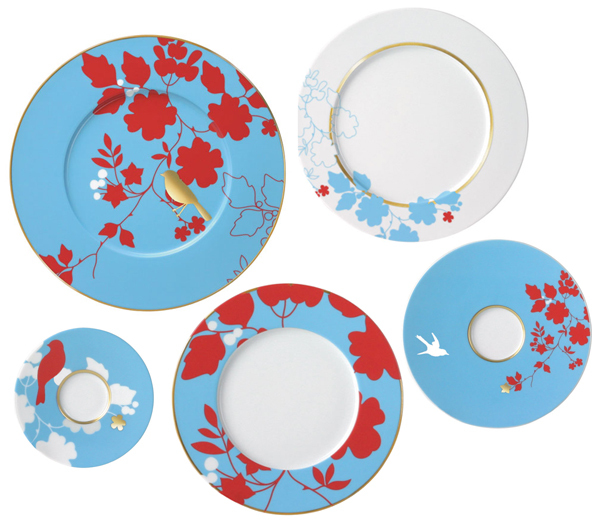 From left top, clockwise: Serving Plate, Dinner Plate, Large Saucer, Bread Plate, Small Saucer. From $56 to $240. I can’t get enough of red and blue combos lately. THESE are gorgeous! These are so great! Thanks for sharing your finds!